Establishing an estate plan is one of the most important steps you can take to protect your family and loved ones. 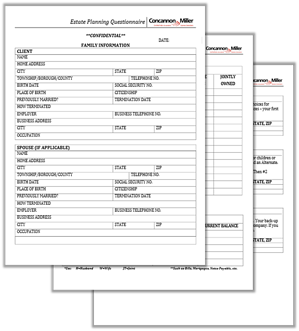 Concannon Miller’s Estate Planning Questionnaire helps you assemble all the information you need to get started planning for their future. Simply complete the information on the right and then click “Download Now” for instant access to this comprehensive Estate Planning Questionnaire.